Set over two floors, with sumptuous and luxurious furnishings, you'll find everything you need at Royal Villa. It's in a quiet spot, with stunning panoramic sea views. Set over two floors, with sumptuous and luxurious furnishings, you'll find everything you need at Royal Villa. 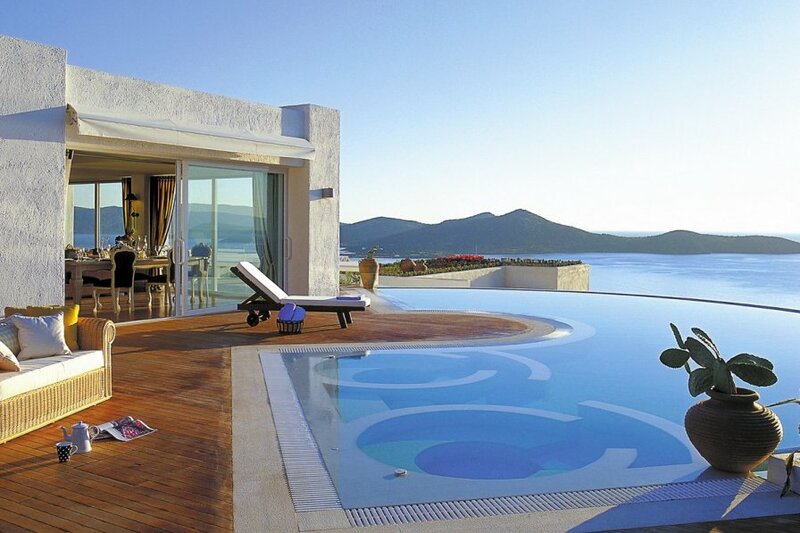 It's in a quiet spot, with stunning panoramic sea views, looking out across the Gulf of Mirabello. The villa is located within a boutique villa-hotel complex, so you will have all the comfort of a private house, but the convenience of a hotel is only moments away. On the ground floor is a wonderful 350 m2 open plan living and dining space. The furniture is French in style, with a sophisticated feel; there are sofas and a TV here, as well as a formal dining area. The wonderful floor to ceiling windows and doors make the most of the sensational sea views. There's an open plan kitchen just here, with all modern appliances and everything you might want. There's a private gym with fitness equipment, a sauna and a steam room on this level too, with shower and guest WC. On the first floor, you'll find the four bedrooms – two are king sized, and two with twin beds – offering all the flexibility your party might need. All four bedrooms have en-suite marble bathrooms, and like the rest of the villa, have been finished to an extremely high standard with hand-painted ceilings and high specification fittings. They are also all air-conditioned, so you'll be kept deliciously cool even in the warmer months. Head outside and you'll find a private infinity edge swimming pool, complete with two Jacuzzis, terraces with lounge seating, a covered dining area and lawn for children to run. The views from here really are sensational, offering an unrivalled panoramic vista – so grab a drink and relax here with a good book, or simply gazing out to sea. You'll be able to completely switch off, happy in the knowledge you have a luxurious, sumptuous and relaxing villa to retreat to.